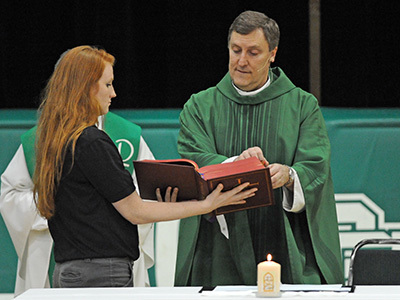 How can you help Providence Catholic? 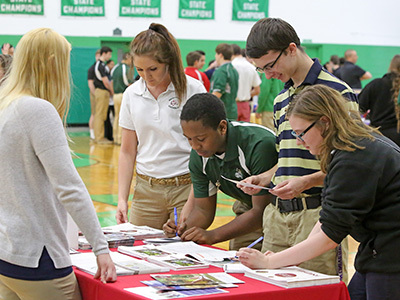 In our spirited pursuit of excellence as a college-preparatory school, we provide rigorous programs at all levels in academics, arts, and athletics along with extensive extracurricular activities. We invite you to support our mission and our students by making a gift. 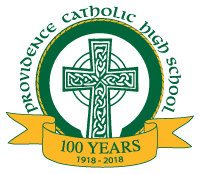 Through your financial support, you have the ability to help build on the past century of educational success provided by Providence Catholic and help build a strong future where our students grow in confidence and compassion. We rely on the generosity of our donors to meet the gap between tuition and the cost to educate and to help create and support innovative, first-rate programs and facilities such as the new student commons. Our legacy of success is built on partnerships with our benefactors. Thank you for your gifts! We are celebrating 100 years of education! The strength of our school legacy is based on those who have been involved since our beginnings in 1918. Your gifts help us, help our students. As stated in our mission statement, “we invite young men and women, along with their families to join us in the blessing that is Providence, and in so doing, BECOME SOMETHING GREATER, together.” One in four Providence families need tuition assistance. Thus,financial aid, remains the number one priority for our school. 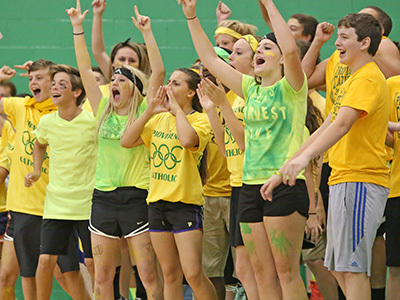 Your support of the annual fund makes a difference for the students of Providence Catholic. Credit Card – Select the Donate Now button above to make your donation securley online. Stock Donation -For gifts of stock, please note our account number has changed effective December 2018. We ask that you contact our offices in advance and let us know the date of your gift, the name(s) of the securities, the number of shares being transferred, and how you would like your gift to be used. Notify Ed Barrett, Director of Advancement, by letter, email or phone (815) 717-3164 of your intention so that we can ensure that transaction is properly completed. If you own stock, it is often more tax-wise to contribute stock than cash. Gifts of appreciated stock are fully deductible. This is because a gift of appreciated stock generally offers a two-fold savings. First, you avoid paying any capital gains tax on the increase in the value of the stock. Second, you receive an income tax deduction for the full fair market value of the stock at the time of the gift. In-Kind and Other Gift Sources – A Providence education will last a lifetime. Parents, families, and friends must be actively involved in order to maintain this program of quality education for today’s students, the adults of tomorrow. Your participation will make a difference. As a member of the Providence family, you can get involved through In-kind Gifts (Tax advantage) – Providence purchases many supplies for its daily activities, events, and renovations. You or your company can help offset our expenses by donating product or merchandise to Providence. Contact Advancement for a letter verifying your In-Kind gift to the school. Donor Advised Funds – Donor Advised Funds (DAF) are a tax vehicle set up by a benefactor front loading charitable gifts to be paid in the form of grants to 501(c) 3 organizations. DAF is established through a bank, investment firm or community foundation. A donor-advised fund is like a charitable investment account, for the sole purpose of supporting charitable organizations. When benefactors contribute cash, securities or other assets to a donor-advised fund they generally are eligible to take an immediate tax deduction. Real Estate – A gift of real estate can also be tax-wise. A residence, vacation home, farm, acreage or vacant lot may have so appreciated in value through the years that its sale would mean a sizeable capital gains tax. By making a gift of property instead, you would avoid the capital gains tax, and, at the same time, receive a charitable deduction for the full fair market value of the property. Life Insurance – Gifts of life insurance can provide a significant charitable deduction. You could purchase a new policy or donate a policy that you currently own but no longer need. To receive a deduction, designate Providence as both the owner and beneficiary of the life insurance policy. Check with your insurance agent for the details. Bequest -Providence can be named a beneficiary in your will in any one of a number of simple ways. An outright gift, either a designated dollar amount or percentage of your estate, could be specified. Providence could also be named as a remainder beneficiary to receive funds only after specific sums have been paid to individual beneficiaries. Not all of the available methods of giving could be included on this site, and not all the tax ramifications of each form of gift could be explained. Check with your attorney, accountant or other tax advisors for additional information on how these general rules apply to your situation. or Jane Lagger, Director of Annual Giving at (815) 717-3162.